In case you haven’t heard, Dexcom recently came out with the Dexcom Share System. The Dexcom Share system essentially allows a person using a Dexcom CGM to connect their receiver to their iPhone via bluetooth and a special Share app and send their Dexcom readings into the cloud, where they can be accessed by up to five “followers” the Dexcom user has invited to view their data, also via a special Follow app. It’s a pretty basic system compared to Nightscout, but it is also very easy and simple to set up and go. The downsides for many people at this point is that it requires at least 2 idevices – 1 for the sharer, and 1 for each follower (each follower would need their own idevice). There is not currently a supported watch that can display the numbers although it is rumored that the apple watch will have an app available when it is released in April. Assuming you want to or can afford to purchase an apple watch. At $350+ price tag this mom will not be getting an apple watch, and neither will her 11 yr old. The apps also are not currently Android compatible, and many people with Android phones are stuck waiting for this compatibility or trying to find other options (Some have started nightscout, while others decided to purchase idevices to use, others still have chosen to just wait for Dexcom to come out with android apps). So, once again, the nightscout team has come to the rescue. Within a few hours of receiving their Dexcom with Share receiver fellow Nightscouters Scott Hanselman and Ben West were able to cobble together a system that allows current idevice users with Dexcom Share to upload their Share receiver data into their nightscout database and websites, which allows for continued use of the existing pebble smartwatches that many nightscouters have been using since early on in this project. This system is independent of the nightscout “rig” and for many people who simply want an inexpensive system (assuming they were already idevice users) with watch compatibility NOW, this is an awesome solution. It does have some quirks, but for what it is, it’s pretty amazing. I set our “bridge” up today and when Angelina goes back to school she will have to carry half the stuff that she’s been carrying since we started Nightscout last July. We have been an iphone family since 2010 so upgrade to the Dexcom Share was a no-brainer (especially considering we just got a ne receiver in February so we qualified for the upgrade free of charge) and added no additional cost to our management options. By using the new Share2nightscout bridge Angelina no longer has to carry around the nightscout rig. She can go back to snapping her Dexcom receiver onto her pump belt and having her iphone in her bag like she did before we started remote monitoring. This also means no more carrying the diabetes bag during PE, unless she chooses to, while still utilizing the Dexcom during that time, as well as the remote monitoring. I posted on Instagram a few weeks ago a picture that told a pretty powerful story: the best system is all of the systems. They each have their benefits, but also their weaknesses. I have NEVER, not once, received any kind of audible alarm from Nightscout on my iphone. I’ve tried using several different browsers and I have even opened the most reliable browser, hit the alert sound test button to make sure it works then sat and watched the red box show up on the NIghtscout screen showing an alert state, but still NO audible alerts, even after 10-15 mins of the phone clearly showing an alert state. This has definitely been one of the downsides to Nightscout for me. Since getting my Pebble watch at Christmas I get vibration alerts on my wrist, which are VERY reliable. But, they are almost TOO reliable. Any time you switch to any of the other apps or watchfaces on the Pebble it resets the “snooze” feature, this seems to include clearing notifications, etc. so that means that my watch vibrates a LOT. Anyone who’s ever used a Dexcom and set their alert settings very tightly probably knows about alarm fatigue. Essentially, you become desensitized to the alarms because it seems like they are always alarming. So, you’re more likely to ignore them assuming that it’s the same thing it was 10 minutes ago. The bright side of this is it’s a watch, so it takes little to no effort to glance at it to see if it really is something I need to pay attention to, or if it’s simply vibrating because I just cleared the notification that someone liked my facebook status. 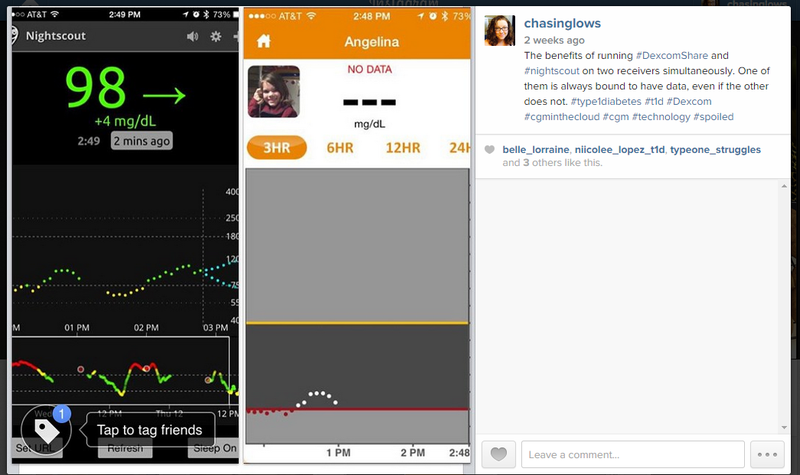 Dexcom Follow app clearly has the advantage here, at least in my experience and opinion. The alarms have fully customizable settings. You can choose settings like “Alert me to readings over 180 mg/dL after 60 minutes and snooze for 120 minutes” So, I’m not getting a high notification every time Angelina eats something, but I will get one if she went above her target range and stayed there more than an hour, meaning that it might be time to send a gentle reminder to check and do correction. Or at least a prompt for me to take a look at the graph (from home, or the grocery store- all while she’s at school) and see if I can figure out why things aren’t where they should be. The delayed alarms are pretty awesome in my eyes, especially since I am dealing with a tween who is slowly learning to take on more responsibility for her care. It allows me to still know when things are going on, but without the temptation to text or call as soon as something happens – often even before she gets a chance to think about doing something about it. It’s a safety net that allows her to take care of herself, but I’m there to catch her if she doesn’t. I’m not rushing to give instructions right away, but also not sitting back and letting things go totally off the rails, or at least not for very long. With that said, down side to share2nightscout bridge is you lose some of the advanced features of nightscout. Raw data is a big thing that was recently added that I find incredibly helpful. Raw data is basically the data sent from the transmitter before the algorithm is applied in the receiver. The benefit of this is that when the receiver shows ?? ?, hourglass, or is in the warm up period and not showing numbers you can still see the raw data and have a ballpark of idea of what glucose levels are. Rather than give this up completely, I opted to set up a separate azure site and Mongo database for the bridge data. This way other times I can still hook up the full nightscout system to still get readings, without ending up with duplicate data on our nightscout site, etc. I also installed a new pebble watchface today that shows two receiver’s data on the same watchface. 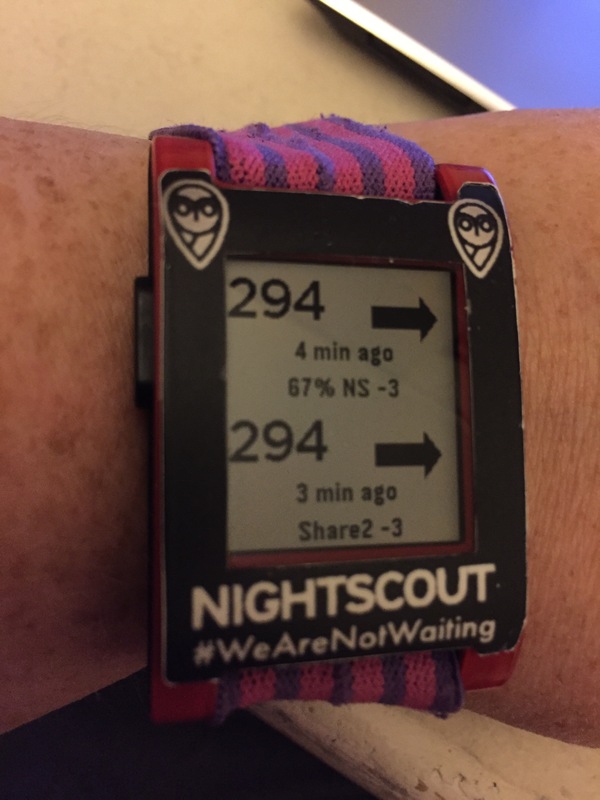 The watchface was created for those who are monitoring more than one person with diabetes, but I set it up to show me data from both the nightscout rig (when we use it) and the Share receiver through the bridge. On to the Chicken Soup portion of my post. As I posted over the weekend, Angelina and I attended JDRF Type One Nation Summit event on Saturday. There were several hundred people at the event so it was inevitable that one of us would pick up some kind of bug and bring it home. Of course it had to be Angelina who got sick. She started complaining of a sore throat yesterday afternoon and by bedtime had a low grade fever. Overnight her blood sugar levels shot up pretty drastically and she got correction around 3am and again at 6am, along with an increased temp basal rate. She also stayed home from school today, which kind of stinks because she will also be missing tomorrow and tomorrow was supposed to be field trip day (and I was going as a chaperon as well). I emailed her teacher this morning to let her know we most likely would not make it tomorrow just in case she needed to make other arrangements for chaperons. It was a pretty low key day. Angelina ended up sleeping in until almost noon and when she did get up she moved from the bed to the sofa and has sort of just moped on the sofa all day. She definitely has some kind of upper respiratory thing going on and was complaining of her ears feeling clogged and her hearing being impaired like her ears need to pop. She still had a little bit of a fever and just generally was feeling tired and weak. So I decided to make some homemade chicken noodle soup. 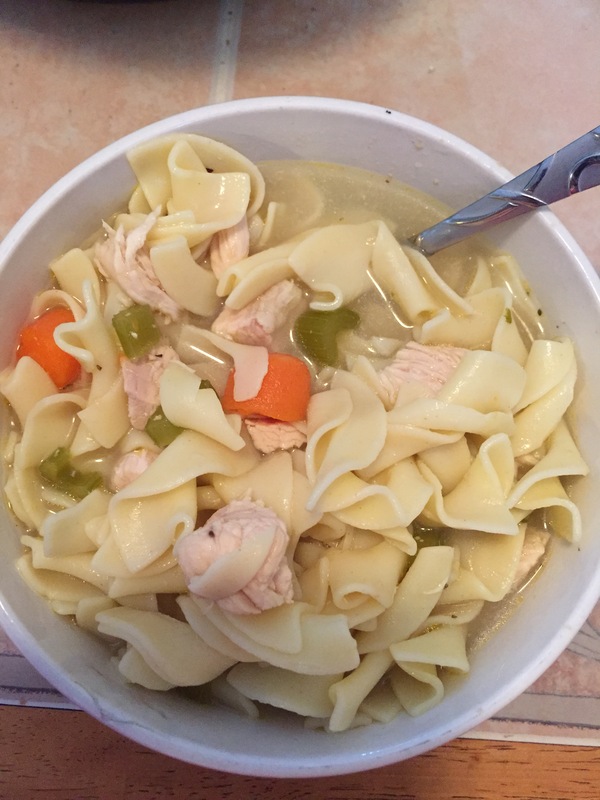 I don’t normally post recipes on my blog, but it’s my blog and I do what I want, so I’m going to tell you how to make some chicken noodle soup. In a stock pot or dutch oven combine veggies, chicken, stock and water. Bring to a boil for about 10 minutes, or until chicken is cooked through and veggies are softened. Add Italian seasoning, black pepper, onion powder and celery salt – listed amounts are estimates, adjust to taste. Reduce heat to low and allow to simmer until vegetables are tender, about 20 minutes. Meanwhile, in a separate pot bring water for noodles to a boil and cook egg noodles according to package directions. When noodles have finished cooking rinse in hot water and add to soup. Allow to simmer for a few additional minutes for noodles to soak up broth. Serve! My pot of soup contained about 8 large-ish servings that were approximately 35-40g carbs per serving. If you eat soup in more normal sized bowls or portions this would easily make 12-16 servings which would be between 20-25g carbs per serving. You can further reduce the carbs per serving by using less than the entire 12 oz package of noodles. As you can see it was quite a lot of noodles, but that is how everyone in our house likes it. ﻿ ﻿I’m going to rant for a moment because what the ever loving heck is going on here?!?!? I went to bed at 11pm and gave correction for a 170bg. I got woken up at 3:30am by this lovely new share contraption to a 254 bg. 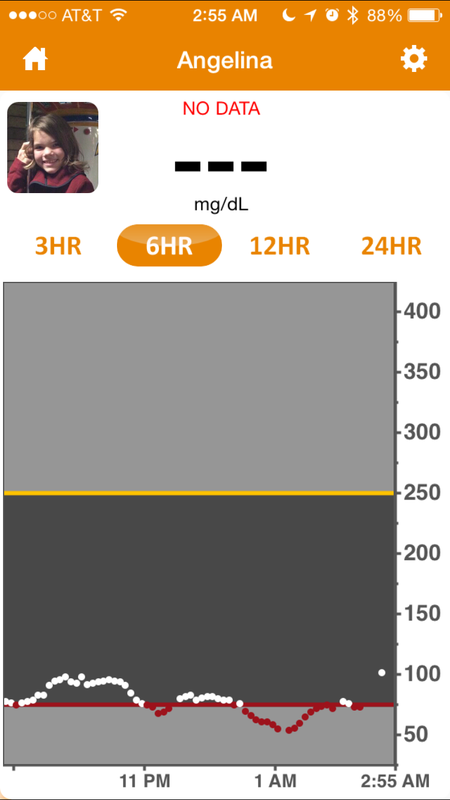 Corrected, started a 150% temp basal (that’s +50% for you non-medtronic people) and figured she’d be good by morning. Apparently during this middle of the night shuffle I managed to flip the switch in my phone to vibrate. Share does NOT give audible alerts when the phone is on vibrate, just FYI. So imagine my surprise when my alarm went off at 7:15am and Dexcom says she’s 297. Fingerstick says she’s actually 321. Correct. Extra correct. Check ketones- negative. 200% temp basal for the morning. Go back to bed. Wake up at 10:30am bg is 135. Hooray! Did I mention we did something not dissimilar the night/day before? I want to blame the time change, but I’m pretty sure time change doesn’t make a person’s body totally laugh at two different correction doses, double their basal insulin dose and keep on rising. Oh yeah, and it’s a sure-t set that was new on Sunday afternoon so not a cannula issue. This post is courtesy of #dblogcheck. If you’re not sure what that is then click the hashtag! Back in December one of my favorite D-moms posted an article about diabetes and depression in children. It is an anonymous D-mom’s story about her 11-year-old son suffering from depression and ultimately ending up in a psychiatric hospital for stabilization. The story touched me in many ways, at first because I have a child who is 11. Second, because I’ve personally had the experience of spending some time in a psychiatric hospital for severe depression. The story made me feel very deeply for this family because it was hard to imagine watching my own child go through this same sort of downward spiral and not fully realizing exactly how deep that spiral had gone. And then having the added fear of not only hearing your child say they want to end their own life, but then also trying to make arrangements for them to be safe, when everyone you talk to at the facility they are going to doesn’t understand or know how to manage their diabetes. And because your child is depressed and suicidal they can’t manage their own care because, in case you didn’t realize it, too much insulin can be a deadly. Lack of insulin can be deadly. Having suicidal thoughts and not getting proper treatment can be deadly. I don’t want to even think about how helpless that mom must have felt having to make those arrangements. A few weeks before this article I had been growing increasingly concerned about Angelina’s mental health. Her therapist had also expressed some concern about her moods and was concerned about depression. She had become more withdrawn in her therapy sessions and about every third session she wouldn’t speak at all, but sit and sulk. At the beginning of January we met with her psychiatrist (who prescribed medications for her ADHD) and I had briefly mentioned we were concerned about depression and requested that she reach out to the therapist. I signed a release form and hoped that the therapist would be able to explain better than I was what was going on. The psychiatrist seemed unaffected and said that mood swings were common at this stage. We discussed how her current ADHD medication didn’t seem to be working well for her anymore and she prescribed a new one to try. She suggested that we keep an eye on things and follow-up next month. Things continued this way at therapy for the month of January. The first week of February we met with the psychiatrist again and again I expressed concern about depression, as well as the therapist’s concern about depression. She seemed to take things a little more seriously this time, but we still mainly focused on how things were going with the new ADHD medication and general talking points “How’s school?” Fine. “How are your grades?” I don’t know. “Are you hanging out with any friends?” No, I don’t really have any friends. Those were about the only words muttered by Angelina in our 25 minute visit before she sort of curled up on the end of the sofa and started at the floor. Any further attempts to engage her were met with stony silence. At 20 minutes into the appointment, after nearly 3 minutes of no one saying anything the therapist says “We’ll follow-up in a month. If she’s having more bad days than good we can possibly discuss medication.” and we scheduled our next appointment and left. That brings us to the past month. There are still more good days than bad, but there are more of those days where one minute things are fine and the next minute her entire attitude, mood and disposition change and she is sullen and completely withdrawn and refuses to speak or interact. About 3 weeks ago Angelina’s therapist asked me back to talk alone for a few minutes, and I ended up talking to her the entire session time while Angelina sat in the waiting room. We discussed the possibility of antidepressants and her response was “I’m a therapist. I don’t automatically jump to medication to try to help people. But I’ve been seeing Angelina for a year and a half and in the past few months she talks to me less and less and I’m at the point that I don’t know what to do or how to reach her. I can’t help her if she doesn’t talk to me. It’s obviously your decision, but at this point I think medication might be a good idea.” About a week after our last visit with the psychiatrist I mentioned to my husband that we had discussed medication for depression. I was a bit surprised when his response was “No. She’s already on enough medications. I don’t think that’s necessary. A lot of kids this age deal with depression. She doesn’t need to be medicated.” And for the past few weeks we’ve dug up this discussion a few times, always meeting at a stalemate. We were finally able to reach an agreement yesterday. Today Angelina saw her psychiatrist and tomorrow she sees her therapist and will start taking an antidepressant.